Here is a list of Bible verses and quotes I’ve put together for Mother’s Day. These could be used in writing mother’s day greetings cards, mother’s day sermons, mother’s day Sunday school lessons or crafts. Leave me a comment if I’ve left off your favorite scripture for mother’s day. John 19:26-27 When Jesus saw his mother and the disciple whom he loved standing nearby, he said to his mother, “Woman, behold, your son!” (27) Then he said to the disciple, “Behold, your mother!” And from that hour the disciple took her to his own home. Mark 10:29-30 ESV Jesus said, “Truly, I say to you, there is no one who has left house or brothers or sisters or mother or father or children or lands, for my sake and for the gospel, (30) who will not receive a hundredfold now in this time, houses and brothers and sisters and mothers and children and lands, with persecutions, and in the age to come eternal life. Matthew 10:37-38 ESV Whoever loves father or mother more than me is not worthy of me, and whoever loves son or daughter more than me is not worthy of me. (38) And whoever does not take his cross and follow me is not worthy of me. Matthew 15:4-6 ESV [Jesus speaking] For God commanded, ‘Honor your father and your mother,’ and, ‘Whoever reviles father or mother must surely die.’ (5) But you say, ‘If anyone tells his father or his mother, What you would have gained from me is given to God, (6) he need not honor his father.’ So for the sake of your tradition you have made void the word of God. 2 Timothy 1:5 ESV I am reminded of your sincere faith, a faith that dwelt first in your grandmother Lois and your mother Eunice and now, I am sure, dwells in you as well. Deuteronomy 5:16 ESV “‘Honor your father and your mother, as the LORD your God commanded you, that your days may be long, and that it may go well with you in the land that the LORD your God is giving you. Proverbs 31:2 8Her children rise up and call her blessed; Her husband also, and he praises her. 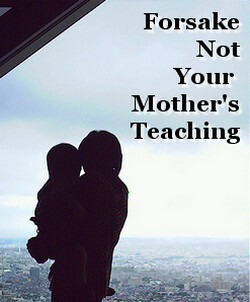 Proverbs 6:20-22 ESV My son, keep your father’s commandment, and forsake not your mother’s teaching. (21) Bind them on your heart always; tie them around your neck. (22) When you walk, they will lead you; when you lie down, they will watch over you; and when you awake, they will talk with you. Proverbs 15:20 ESV A wise son makes a glad father, but a foolish man despises his mother. Proverbs 19:26-27 ESV He who does violence to his father and chases away his mother is a son who brings shame and reproach. (27) Cease to hear instruction, my son, and you will stray from the words of knowledge. Proverbs 23:22-25 ESV Listen to your father who gave you life, and do not despise your mother when she is old. (23) Buy truth, and do not sell it; buy wisdom, instruction, and understanding. (24) The father of the righteous will greatly rejoice; he who fathers a wise son will be glad in him. (25) Let your father and mother be glad; let her who bore you rejoice. Proverbs 28:24 ESV Whoever robs his father or his mother and says, “That is no transgression,” is a companion to a man who destroys. Proverbs 30:11 ESV There are those who curse their fathers and do not bless their mothers. Proverbs 31:10-12 ESV An excellent wife who can find? She is far more precious than jewels. (11) The heart of her husband trusts in her, and he will have no lack of gain. (12) She does him good, and not harm, all the days of her life.